When American CEO/Dictator Donald Trump appointed former general John Kelly as Chief of Staff, many breathed a sigh of relief in hoping that maybe the stoic ex-Marine could keep Trump in line. Ahhh! What naivete! John Kelly has proven in recent weeks that he’s not really not that different from Trump and that he’s only another enabler to the orange haired man-child who is our current President. Take Kelly defending Trump’s recent call to a military widow where he told a grieving widow “he knew what he signed up for”. Kelly not only defended Trump but criticized Representative Frederica Wilson’s criticism of Trump’s wording. Trump’s press secretary,a.k.a. 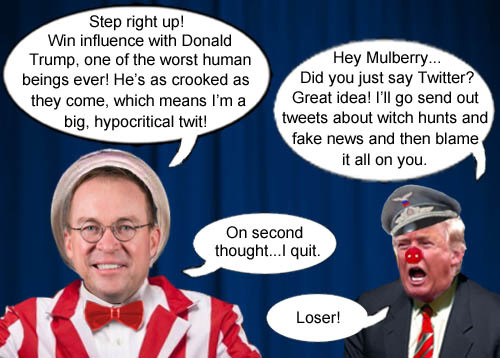 secretary of deception, Sarah Huckabee Sanders even went as far as to say it was inappropriate of Wilson to question Kelly because he was “a four star general”. Well how authoritarian of you Ms. Huckabee Sanders! Mr. Kelly isn’t in the military anymore. This is a democracy and there is such a thing as freedom of speech and freedom of the press, which is guaranteed by the U.S. constitution. When John Kelly says and does things which are undemocratic and wrong, it is our right as Americans to question him. Speaking of which…last week, Kelly showed his ignorance on history when he claimed that the Civil War could have been avoided if only the South and North would have been willing to compromise. Like Professor Stephanie McCurry says, “That statement could have been given by [former Confederate general] Jubal Early in 1880”. Well, the North and South did compromise before in 1820 (Missouri Compromise) and the Compromise of 1850 and those compromises only postponed the inevitable. It took a war to rid this nation of the disgusting institution of slavery. But unfortunately, thanks to the botched Reconstruction and Jim Crow laws, racism persists today. Unbelievably, we have Confederate revisionists in power in this country who want to return to those glory days of white supremacists, KKK marches and frightened minorities. Mr. Kelly: your authoritarianism and racism are showing and it’s pretty ugly. 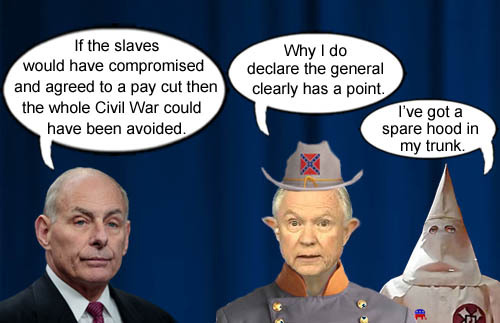 American CEO/Dictator Donald Trump’s authoritarian Chief of Staff, John Kelly, revises history by claiming failure to compromise caused the Civil War which delights Confederate Attorney General Jefferson Beauregard Sessions III and an old, hooded, Confederate white knight.